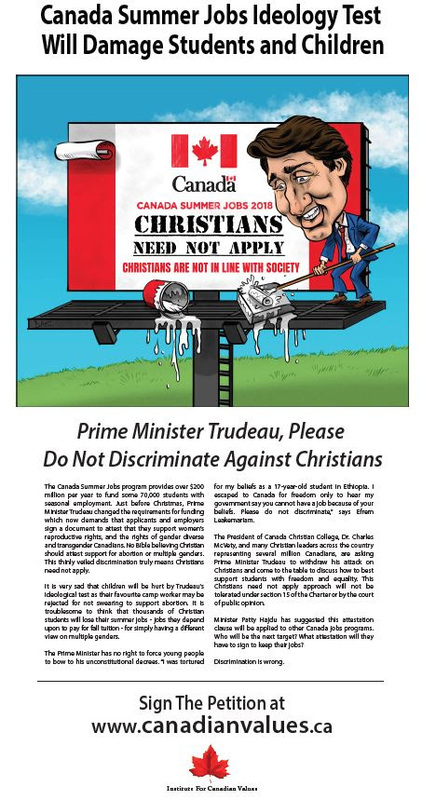 Max Solbrekken World Mission: Christians Need Not Apply - Canada Summer Jobs Ten prominent Christian leaders travelled to Ottawa to address the Canada Summer Jobs program at a press conference in Parliament and personal meetings with MP's. CBC reported "Religious leaders say they'll challenge 'fascist' summer jobs form on charter grounds." The MP meetings went very well with most committing to fight for freedom and equality for Christians. Opposition leader Andrew Scheer said "The government does not have the right to force people to sign a form that violates their conscious or beliefs in order to qualify for government programs or funding. To allow the government this power is to threaten our fundamental human rights.” The one spear heading the effort is Ted Falk - “The Prime Minister talks a lot about respecting diversity, but his actions tell a different story. Of course this is outrageous and Canadians know it. Canadians must be free to apply for government funding or programs without fear that they will be rejected for simply having different values and beliefs than those of the Prime Minister.” Brad Trost - “I just got an email update on the summer jobs program from the local civil service. They have noted that applications for summer job programs in my riding area are down fifty percent. Five zero percent.” Harold Albrecht - “This isn’t about the activities or services an organization is engaged in. This is about targeting the personal beliefs of the individuals who run those organizations and threatening to deny funding if those beliefs do not line up with Justin Trudeau’s own values.” Thanks to people like you we were able to put the below full page ad in the National Post to raise awareness on this issue. Christians Need Not Apply - Canada Summer Jobs Ten prominent Christian leaders travelled to Ottawa to address the Canada Summer Jobs program at a press conference in Parliament and personal meetings with MP's. CBC reported "Religious leaders say they'll challenge 'fascist' summer jobs form on charter grounds." The MP meetings went very well with most committing to fight for freedom and equality for Christians. Opposition leader Andrew Scheer said "The government does not have the right to force people to sign a form that violates their conscious or beliefs in order to qualify for government programs or funding. To allow the government this power is to threaten our fundamental human rights.” The one spear heading the effort is Ted Falk - “The Prime Minister talks a lot about respecting diversity, but his actions tell a different story. Of course this is outrageous and Canadians know it. Canadians must be free to apply for government funding or programs without fear that they will be rejected for simply having different values and beliefs than those of the Prime Minister.” Brad Trost - “I just got an email update on the summer jobs program from the local civil service. They have noted that applications for summer job programs in my riding area are down fifty percent. Five zero percent.” Harold Albrecht - “This isn’t about the activities or services an organization is engaged in. This is about targeting the personal beliefs of the individuals who run those organizations and threatening to deny funding if those beliefs do not line up with Justin Trudeau’s own values.” Thanks to people like you we were able to put the below full page ad in the National Post to raise awareness on this issue. The McVety Report (formerly "Canadian Times") seeks to bring you the truth on important matters that you won't get from CBC or mainstream news in Canada. Stay tuned for weekly news stories and updates!